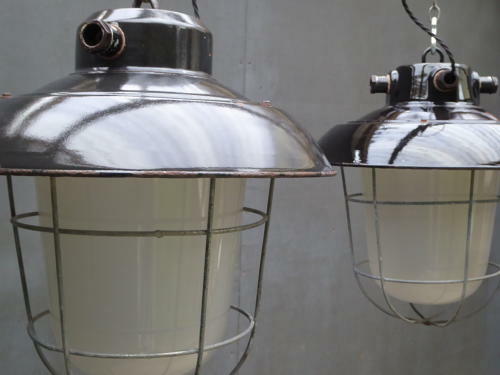 Large vintage industrial Czech factory pendant lights. A fantastic pair of pendants with black enamel uppers, thick frosted glass shades & protective steel cages. Industrial classics which would look great in a retail or domestic setting. Rewired in twisted black three core flex. Two available, priced per light. Wear commensurate with age, good condition overall. The lights are identical barring the number of wire exits on the uppers (one with four, the other with two & the enamel shade differs slightly as pictured). UK courier service available at £12 for a single light & £3 additional per light thereafter, tracked & signed for 24 hour delivery.